EU-CELAC flogs. Photo: European Union, some rights reserved.The last EU Summit with the Community of Latin American and Caribbean States (CELAC) was held in Brussels in June 2015. 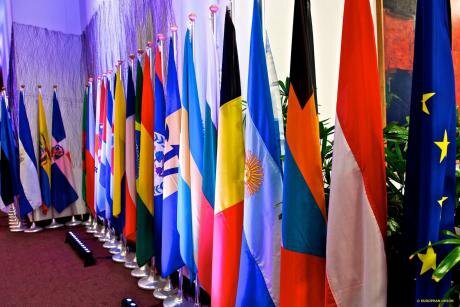 A new one, expected to take place in El Salvador in October 2017, has been postponed sine die – a a bad signal for the developing strategic partnership between the two world regions. The two years that have passed since the summit in Brussels have not brought the manifold changes that the European policymakers anticipated. The new European Consensus on Development, approved in June this year, underlines the importance of innovative approaches in the Union’s relation with emerging actors, tailoring EU instruments to the needs of these advanced partners in order to contribute to the implementation of the Sustainable Development Goals agenda. In this context, triangular cooperation appears as the flagship solution. It is a response to a new reality in which Latin American actors are relying more and more on South-South cooperation approaches, sharing best practices and implementing programmes on a horizontal cooperation basis – that is, applying solutions which have already been tested by actors with similar levels of development. The EU participation in this new framework through triangular cooperation and in partnership with developing actors in the region still needs, however, more definition and a strategic approach. The EU tendency to shift its Official Development Assistance (ODA) budgets towards country programmable aid (53% of the total ODA) can be a useful tool in this context. Defined by the Organisation for Economic Co-operation and Development (OECD) as “the portion of aid that providers can programme for individual countries or regions, and over which partner countries could have a significant say”, this type of aid offers the possibility of more horizontal dialogues. Yet, the main dilemma remains: how will old instruments such as the Development Cooperation Instrument (DCI), the main EU instrument in the region, respond to these new challenges? How will the EU materialise a greater involvement from its counterparts in the programming of its budget and actions? For the time being, the results seem rather gloomy. The intermediate evaluation of the External Financing Instruments highlights the fact that, currently, the DCI is still following the traditional donor-beneficiary ODA philosophy and is far from providing suitable answers to the new reality in Latin America. The Partnership Instrument, which was introduced in 2014, seems a better adapted instrument for peer-to-peer dialogue and mutual learning, but its reach and funding are very limited. And the gap between the two regions keeps on widening: while the main concern is eradicating poverty, a main issue arising from a joint exercise by EU and CELAC actors concerning the Assessment of programmes and actions was how to measure poverty beyond per capita income, which is the main EU indicator for ODA eligibility – an indicator which is not realistic in the case of middle and high-income developing countries such as the majority of countries in Latin America. But there is also some good news. The revision of the EU Multiannual Financial Framework for the post-2020 period provides an opportunity and the necessary political momentum, on the EU side, for carrying out changes and coming up with renewed strategic frameworks. Some programmes already being implemented in Latin America - such as EUROsociAL+ or EL PAcCTO - are becoming leading initiatives based on a demand-driven approach in key areas such as social cohesion and security. And a new EU programme in the region based on South-South cooperation offers additional arguments for envisaging a positive policy evolution in the years to come. From a political point of view, the next interregional Summit’s mission will be to cement the partnership between the two regions while betting for reinforced mutual learning programmes.